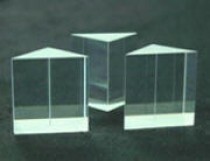 N-SF10, N-SF11, N-SF57, N-BK7, N-LAK21 or N-LAF35 glass. small loss for p-polarized beam. Widely used for GVD compensation in femtosecond lasers. Note: The surface loss of p-polarized light incident at ~ Brewster angle is not sensitive to the Apex angle.